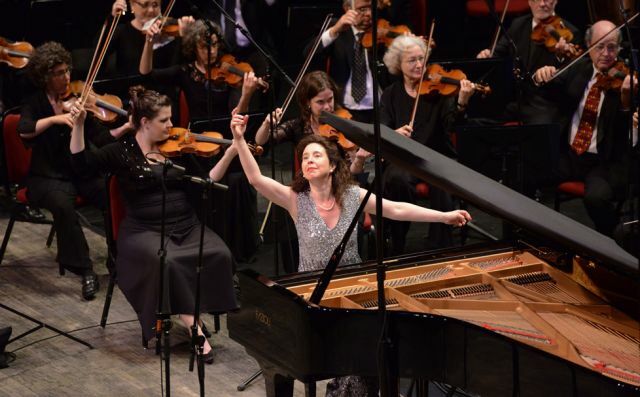 One of the world’s leading pianists, Angela Hewitt regularly appears in recital and with major orchestras throughout Europe, the Americas and Asia. Her performances and recordings of Bach have drawn particular praise, marking her out as one of the composer's foremost interpreters of our time. Hewitt's award-winning recordings for Hyperion have garnered praise from around the world. Her recording of Mozart’s Piano Concertos Nos. 22 & 24 with the National Arts Centre Orchestra and Conductor Hannu Lintu won the 2015 JUNO Award for Best Classical Album of the Year (Large Ensemble or Soloist(s) with Large Ensemble Accompaniment). Her recording of Bach’s The Art of Fugue was released in October 2014, and her ten-year project to record all the major keyboard works of Bach has been described as “one of the record glories of our age” (The Sunday Times). She was soloist for Ondine’s release of Messiaen’s Turangalîla Symphony with the Finnish Radio Symphony Orchestra and Hannu Lintu in summer 2014. Her discography also includes CDs of Liszt, Beethoven, Mozart, Schumann, Ravel, Chopin, Couperin, Rameau and Chabrier. Highlights of Hewitt’s 2014/15 season include concerts with Washington’s National Symphony Orchestra (David Zinman) and Vancouver Symphony, Yomiuri Nippon Symphony and Japan Philharmonic orchestras, as well as Hamburger Symphoniker, Accademia Filarmonica di Bologna and Swedish Chamber Orchestra. She has toured in recent seasons with Camerata Salzburg and kammerorchesterbasel, while other recent orchestral appearances include the Toronto Symphony Orchestra, Orchestre symphonique de Montréal, and Orquestra Sinfônica Brasileira. In January 2015 Angela Hewitt gave a series of recitals with mezzo-soprano Anne Sofie von Otter at the University of Chicago, the Celebrity Series of Boston, San Francisco Performances, Toronto’s Royal Conservatory and New York’s Le Poisson Rouge. As solo recitalist she also returns this season to London’s Wigmore Hall and performs at Bath Bachfest, Amsterdam’s Muziekgebouw, Copenhagen’s Mogens Dahl Koncertsal and the University of Washington. Born into a musical family, Angela Hewitt began her piano studies aged three, performing in public at four and a year later winning her first scholarship. She went on to study with French pianist Jean-Paul Sévilla and in 1985 she won the Toronto International Bach Piano Competition. Hewitt was named ‘Artist of the Year’ at the 2006 Gramophone Awards. She was made an Officer of the Order of Canada in 2000 and was awarded an OBE in the Queen’s Birthday Honours in 2006. She lives in London but also has homes in Ottawa and in Italy, where she is Artistic Director of the Trasimeno Music Festival in Umbria.